Come to the geek side: We have board games! 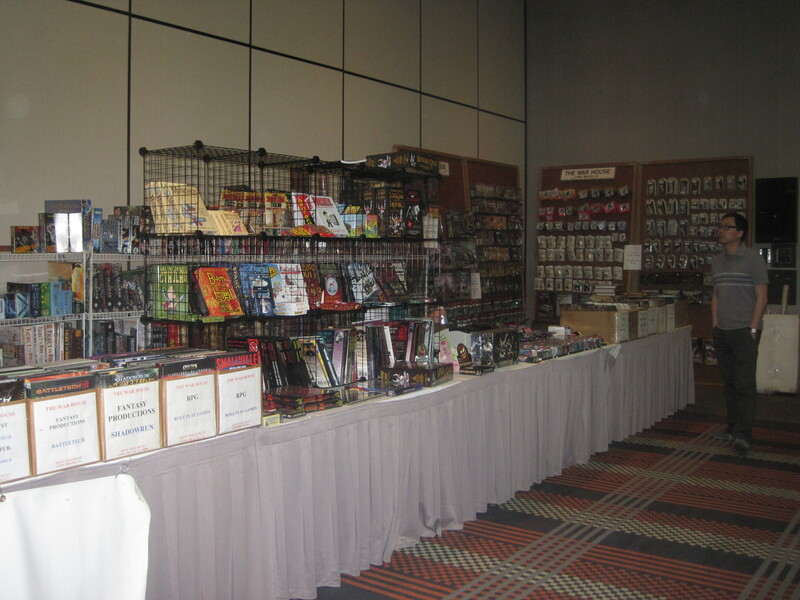 Strategicon actually attempts to appeal to gamers of all types, providing a variety of areas which cater to different types of games. 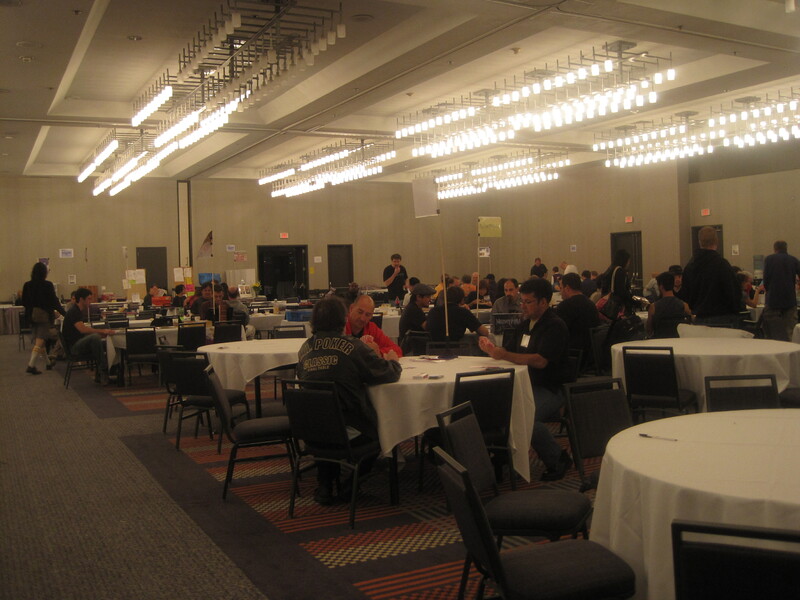 On the first floor one can find a large room of tables for board and card gamers. This is a good area to find a pick up game of Munchkin, Ticket to Ride, Zombies!!! and other similar games. You can also often find folks happy to do demonstrations of games, helping you try out a game that looks like fun, but is a little more off beat than, say, Monopoly. A great area of people not familiar with gaming or with kids. Recently a video game room was added, but we haven’t really explored that area, so we’ll skip that part of the tour. So many games and accessories! On the second and third floors is more what I think of when I say I’m going to Con for the weekend. These are for the tabletop gamers, or RPGs. For civilians – yes, this means D&D, but it also means so much more than that. Games are held basically 4 times a day at regular intervals – 9am, 2pm, 8pm and Midnight, which means that if you don’t believe in sleep, you could potentially play for 3 days without stopping. Most of us sane people plan on skipping every 4th game to catch some shut eye and take a shower. There aren’t a whole lot of us at the convention, so you are forgiven if you are still there on Monday and think the Zombiepocolypse has finally arrived. But lest that throw you off, know that this is less like a thousand of that “comic book guy” character from The Simpsons running around and more like a really geeky version of a rave. We join up in our assigned conference rooms, gather around tables and play our chosen games, much like we might do any given Saturday at home, except that at Con the players tend to be more open minded and beginner friendly. We try to reach out to new players, run games that are light hearted and/or humorous and hopefully easy to get into, and you often find yourself seated with the oddest assortment of folks (in a good way). At one point this last con, I found myself running a GURPS Steampunk game for a friend of mine who had defected from the White Wolf players for my game, an older gentleman with an excellent grasp of Victorian literature, and a lovely family with two teenage sons, one of which took to playing Captain Hook with wild abandon. It was awesome, and really summed up to me everything that makes going to Con fun. If you’d like to give tabletop gaming a try, there is a table for sign ups, which has sign up sheets with brief descriptions of the games available. These generally fall into 5 categories Whatever the current D&D edition is will have games run by the RPGA, one of the oldest gaming clubs. Way back in the days of AD&D I had a membership and even ran a game or two, but I never quite crossed over to 4th edition and have let my membership lapse. Pathfinder, the biggest contender for D&D’s throne for Fantasy Sword & Sorcery style RPG, has the Pathfinder Society. I enjoy Pathfinder privately, but I find Pathfinder Society games a little too… structured for my tastes. If you like participating in ongoing campaigns with alot of structure, though, this is your area. GURPS games tend to be presented by MIB (Men in Black) dispatched by Steve Jackson games. (We’re currently working on our MIB status, and ran a couple games for this group at the last con. We were introduced to GURPS at Stategicon well over a decade ago, so it feels appropriate to make our home with this group. But just as full disclosure – I’m a little biased.) World of Darkness (White Wolf) games are generally supported by our own local Dead Gamers Society. (2nd disclosure – I run for them in between cons.) Lastly, you have all the smaller “independent” games put on by folks who just love the games they are running (Chthulu is especially popular), or would be game designers looking to see if their idea has legs. Personally, GURPS is the most fun for me because the game is super easy to teach to newbies, has a wide variety of variations, which means we can pretty much run anything we think up, and I like participating in the tournament they hold every con. But that’s just me. Pick games that sound fun to you, don’t worry if you don’t know how to play, GM’s will be able to show you – that’s why we’re there, and don’t sweat it too much if a game is “full” on the roster – it’s pretty common for one or two people to not show up when it’s time to sling dice. And remember, no matter how much fun you are having – sleep and shower every 24 hours. Your fellow players (not to mention your GM) will thank you.